MicroCleaning is the process of isolation, containment, air scrubbing and specialize cleaning of all areas whether in a commercial or residential environment that is contaminated with microbial growth such as stachybotrys more commonly known as the “toxic black mold” or Pencillium which are just examples of mold species. This process includes the removal of mold impacted building materials as well as treating the HVAC systems. • We isolate the work area with the construction of a negative pressure containment using poly walls. The type of surface where contamination exists determines the technique or combination of techniques that Advanced MicroClean uses for remediation. First and foremost, containment – isolation – of the work area is implemented. This is critical in preventing the spread of airborne or contact contamination. Microbial remediation, Chinese drywall and lead abatement can include MicroCleaning, environmentally sound removal and disposal of contaminated materials (carpet, tile, gypsum, fabrics, etc. 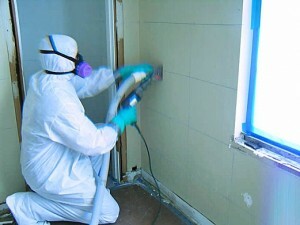 ), antimicrobial coating application and sanitation.